That puts big pressure on beverage distributors and processors, who must efficiently store, handle and ship this ever-expanding jumble of SKUs, not to mention deal with the mashup of packaging types, materials, sizes and shapes, each of which contains date- and temperature-sensitive pressurized contents. Whether it’s bottled, canned or kegged, beer is a challenge to handle and distribute. And while processors and wholesalers may face slightly different challenges – in general, processors handle fewer SKUs but in larger volumes, and wholesalers handle a larger number of SKUs, often in lower volumes, or at the case level, or even in individual quantities – both are faced with storing and processing huge amounts of product efficiently within existing warehousing space. Gravity flow systems are dynamic storage and retrieval systems that are powered by natural gravitational mechanics, decreasing energy usage and lowering operational costs. Sloped rows, racks and shelves get stored product off the floor and into organized, accessible, high-density locations, reducing the amount of space, time and labor needed for fulfillment. 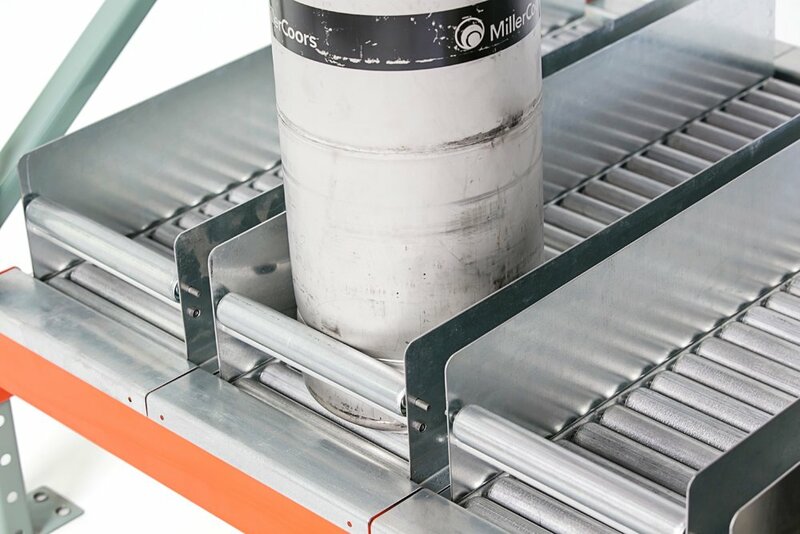 Kegs, cartons or pallets are loaded into the high end of pitched lanes, and product is dispensed from back to front via controlled downward glide to the pick station, an orderly flow that optimizes FIFO inventory turnover and relieves congestion by separating load and pick aisles. Dispensed product is ergonomically positioned, highly visible, and easily identifiable, enhancing worker safety and increasing pick speed and accuracy. Systems are highly fluid, flexible and configurable, allowing responsive adjustments to accommodate changing product specs, applications or operational demands. Gravity flow solutions from UNEX comprise a range of robust, durable keg-flow, carton-flow, and pallet-racking systems, including Span-Track, the engineered-to-order keg-flow system that makes easy work of heavy, hard-to-handle kegs. Want to tap into the latest beer and beverage distribution solutions? See UNEX in Booth 519 at NBWA’s 81st Annual Convention and Trade Show Conference, September 24-25 in San Diego, California. Cheers!